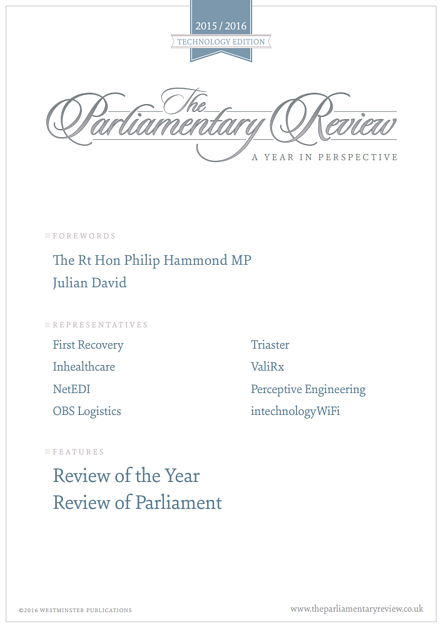 We are proud to announce we are featured in the technology edition of the Parliamentary Review. With a foreword by the Rt Hon Philip Hammond, Chancellor of the Exchequer, it reviews technology trending topics such as Artificial Intelligence, Augmented Reality and Encryption; as well as the Parliament and the EU Referendum. You can find the article under the Highlighting Best Practice section, where our CEO, Dave Renshaw, highlights how our Transport Management System has helped the NHSBT and how our solutions can contribute to the success of your company. If you would like to read the article click HERE to find the article https://www.theparliamentaryreview.co.uk/and turn to page 28.